View More In Measuring & Testing - Page 9. 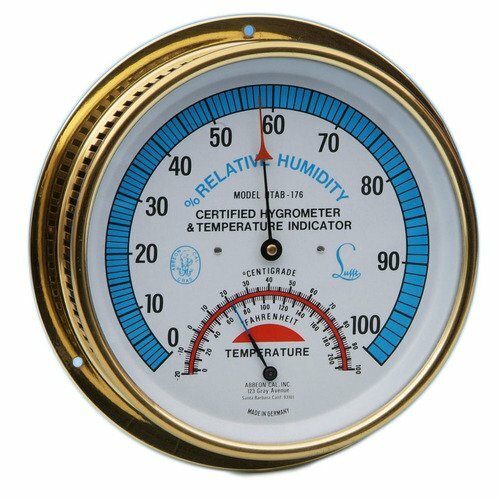 This Thermo Hygrometer measures both temperature and humidity in a wide variety of laboratory settings. Housed in a 6" brass case with an easy-to-read 5" dial, it is certified at a temperature range of between 0° and 100°C (0° and 210°F) to an accuracy of ±1% full scale. In addition, the Thermo Hygrometer measures humidity between 0% and 100% to a ±3% full scale. It is externally calibrated and certified to meet ANSI/SAMA standards. Temperature Range: 0/100°C (0/210°F) ±1.0° C&F. Humidity Range: 0/100% RH ±3.0° Full Range. Externally Calibrated. If you have any questions about this product by THERMCO, contact us by completing and submitting the form below. If you are looking for a specif part number, please include it with your message.